Rancho’s girls basketball team has made its mark with a patient offense and fantastic defense. In the fourth quarter Tuesday, Canyon Springs gave the Rams a painful dose of their own medicine. 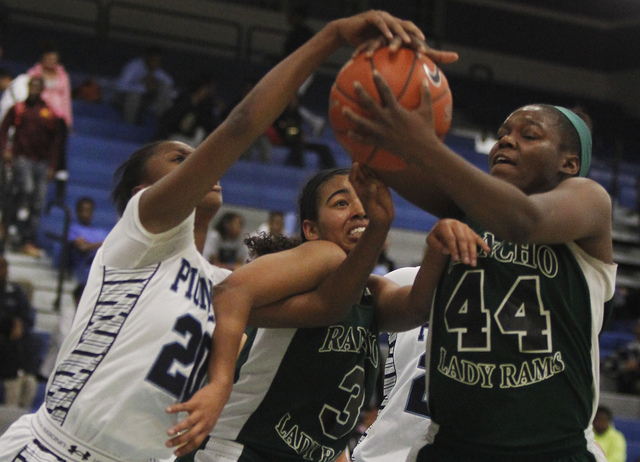 Rancho’s girls basketball team has made its mark with a patient offense and fantastic defense. In the fourth quarter Tuesday, Canyon Springs gave the Rams a painful dose of their own medicine. Usually an up-tempo team, the Pioneers were content to dribble away time and limit possessions in the final eight minutes on their way to a 54-50 home win over the Rams in the Northeast League opener for both teams. “We had to make some adjustments,” Canyon Springs coach Dorothy Kendrick said. “We have to learn how to play both ways. We have to learn how to push the ball and know when to push the ball, but we also have to know how to regroup and be patient. The Pioneers (11-2) scored the first seven points of the fourth quarter while forcing five consecutive turnovers to turn a 44-43 deficit into a 50-44 lead. After trading baskets, Canyon Springs took more than a minute off the clock on its next possession before finally turning over the ball with 2:45 to play. Baskets by Miyah Wilson and LaKissa Martin in a three-second span pulled Rancho within 52-50, but the Rams didn’t score again. Rancho managed just seven shots from the field — one a wild 3-pointer before the buzzer — and had 10 turnovers in the fourth quarter as Canyon Springs turned up its defensive pressure, swarming the Rams with a trapping press. Rancho (14-4) entered the game having allowed an average of 28 points per game, but transition baskets off turnovers, stick-back baskets and drives into the lane allowed Canyon Springs to score 38 points in the paint. “We know that they were going to put pressure on us with their defense,” Kendrick said. Cherise Beynon led Canyon Springs with 20 points, and teammate Alexia Thrower had 13 points and 11 rebounds. Martin paced Rancho with 24 points and eight rebounds, and reserve Kanosha Gray scored 10 points for the Rams.